Honestly! It was not my idea to go buy a gazillion really heavy bushes that need to be planted this weekend. Really, why would I sign myself up for this much work? Why would I sacrifice an entire weekend to dirt shoveling. This is not my style at all. Next thing you know we’ll be borrowing the neighbors rototiller to dig up and level the entire back yard. Damn gnomes! Aw. I love the little heart! still working on that house to settle in with my boys and the new little girl due in february. then i will have weekends of dirt shoveling too. the new stitchettes came today. so very good. If the wernt so darn cute! Soooo cute. Just want one! Not only that, but they seem to be multiplying. You’d better watch those crafty gnomes. i need one of those gnomes. planting required or not. I love the little heart, too! These are so cute!! I can see them peaking out of a pile of cushions, from a shelf, and all over the house. =) Maybe that’s too many gnomes. Please, please, please can we have a gnome put-together book to purchase?!? I love them so! Wouldn’t they would look loverly under a woodland Christmas tree? The ability to put down roots without the near threat of relocation…such a wonderful part of home-ownership. Even though we are currently renting, I will be right there with you. As for the backyard…..letting it grow wild (with streamlined landscape design) means you don’t have to fuss over it…..and your children have a great nature space. If you would like to see my children’s garden designs….let me know…they would be easy to send. much better just to stay inside and sew more gnomes. Gnomes are a sneaky little bunch…but, maybe they’ll help in the end? Yard work is the bane of my life right now! I can understand you. And the gnomes are amazing! I ordered 3 bare roots trees, which arrived yesterday. It took me forever to dig the holes – really heavy clay soil, plus it was wet and windy. When I went to get my little trees, I discovered that the dog had chewed off all the branches. Aaaargh. Those gnomes are marvelous! They make me wants so much the pattern can’t wait! Those gnomes are so clever! Please please please make the gnome pattern available! Good luck with the bushes–ugh! can’t wait for the gnome pattern! Oh i LOVE them! Cute, cute, CUTE! oh my those gnomes are just adorable! pattern! They are sooo perfectly adorable! They equal unending yard work. If you make a gnome that actually does yard work I’d pay really good money for that!!!!!!!!!!!!! I love your gnomes! I recently became obsessed with them after buying the book titled “Gnomes.” Check it out out you haven’t seen it. very adorable! Now you have a scape goat for everything! Sounds handy. I need one for my cubicle. Those are the best garden gnomes I’ve ever seen. I wonder whether they could be made with weather resistant fabric and stuffed with something heavy and actually used outside as garden ornaments for some of the year?! Probably would not be very cuddly then though. Anyway, they’re fantastic and I’m hoping that once I’ve actually got around to making at least one big footed bunny and some of the hand sewn animals there’ll be a gnome pattern on offer! Please make a pattern. I am a gnome-a-holic! Isn’t shoveling SHOCKINGLY hard work? I mean, you think, “Oh, I’ll just move that dirt from one place to another using this handy tool so I don’t have to do it on my hands and knees with a trowel.” And then you’ve practically got a backache by the second time you’ve put the shovel four inches into the ground. My dad was a mining engineer and I sometimes think he got into mining just because he loved digging holes. One summer he decided our huge (3/4 acre, maybe?) backyard needed a built-in sprinkler system so we would be able to sell the house more easily. He must have dug at least 350 feet of trench for it, probably all 2 feet deep. With a shovel. I cannot begrudge him his fondness for wearing a superman t-shirt. Those are the cutest gnomes ever! Your Phoebe and my Sairshe are almost exactly the same age! I am having so much fun with my laughy, smiley baby- she would love to chew on a gnome right about now. 🙂 Congrats on your pretty baby girl! I want to MARRY that gnome- he’s SO DARN CUTE! I agree with the above posters. Definitely need to make a pattern of that little guy! I’ve got a little thing for those wee gentlemen. Even named my blog after them- GREAT STUFF BY THE WAY! holy cow, i love the gnomes. good work. 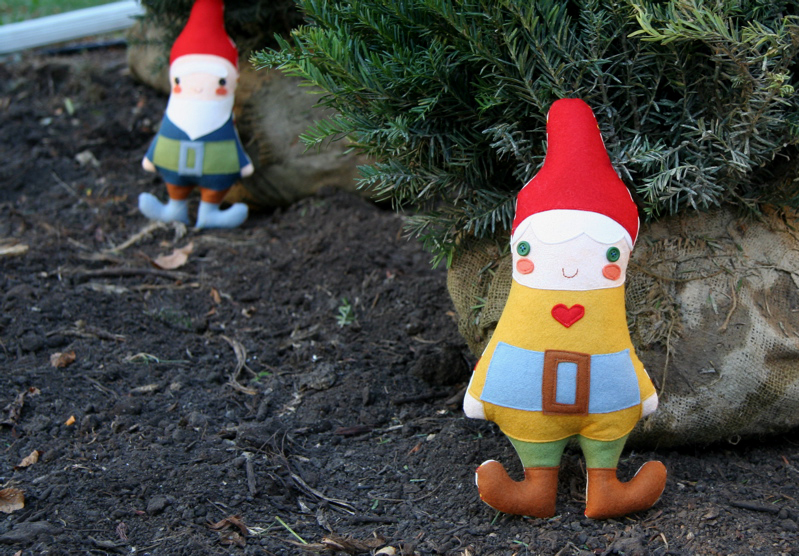 The gnomes are also Lovely! these would make a great pattern! hint, hint! adorable!!! Oh, I NEED a gnome! How fabulous! Instead of the Roaming Gnome, he could be a Roving Gnome.